It’s all sparkles and shine this festive season with DeGem, Malaysia’s contemporary jewellers for the modern woman. 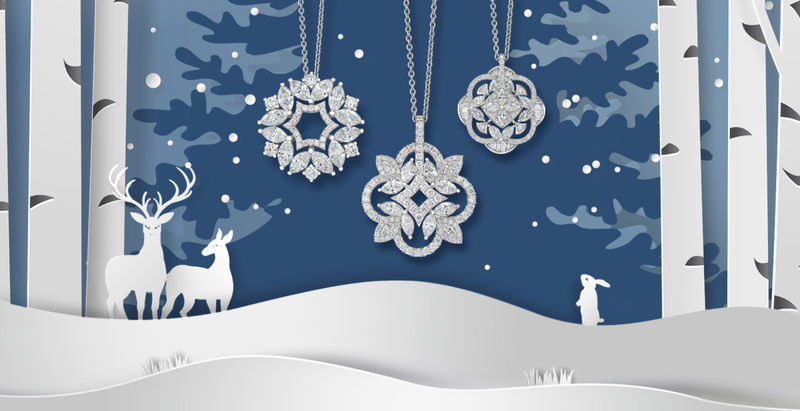 Delicate and unique, the Timeless Christmas diamond jewellery collection takes inspiration from the beauty of snowflakes. This new release features immaculate diamond pendants, two of which incorporate a spinning mechanism – injecting just the perfect amount of glimmer into your Christmas look. If you prefer to invest in timeless pieces, the Soleluna ‘Ajyle’ collection provides a selection that gives you the freedom to gift your loved ones or yourself with a versatile piece to be loved forever. The name of the collection ‘Ajyle’ comes from the word ‘agile’, denoting the fluid movement of the designs that would be the perfect match for any occasion. The Dancing Wave collection focuses on the dynamic shapes of waves while the Harmony series is all about personalisation as the wearer is able to customise the length and adjustable unity cubes to her preferences. All pieces come with a dazzling diamond option so whether you prefer a more subtle hint of glamour to diamonds galore – DeGem has got all of your gifting needs covered all festive-season long. Diamonds are a girl’s best friend and it looks like she has many options to choose from this Christmas.